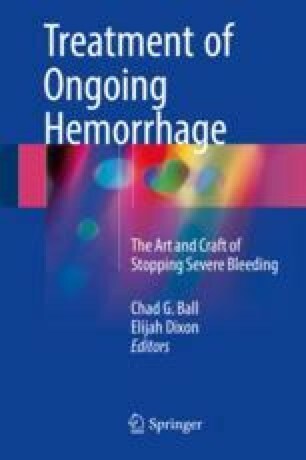 Pelvic Trauma Hemorrhage: How Do We Stop Bleeding in that Space? Patients with pelvic fractures who are hemodynamically unstable represent a unique challenge for the trauma team. Mortality in this severely injured cohort of patients exceeds 30–40% in modern series. Control of life-threatening hemorrhage should be prompt utilizing a combination of pelvic stabilization, goal-directed hemostasis with early blood components, resuscitative endovascular aortic balloon occlusion, and peritoneal pelvic packing. Adjunctive angioembolization may be necessary following external fixation and pelvic packing in patients with ongoing transfusion requirements.